All success begins with some failure . . . I have written about my fun few years in the web industry during the dot-com boom. I had a grand time and enjoyed feeling like my stock options were worth something before the market crashed. Then came 9/11, and I decided to devote myself to doing something meaningful like teaching our holy Torah to the next generation. Honestly, I didn’t have such a grand time for the first few years at all. Kids and classes do not come with instruction manuals. I was never quite sure what I was supposed to be doing and how to judge if I was achieving it. There was content, skills, relationships, professionalism . . .I was sucked into the never-ending list of what teachers should do and trying to pretend like I knew what I was supposed to be teaching and why. When I moved to Rochester, I started a certification program to become a school administrator. The first course I took was “Literacy as Social Practice.” What I learned changed how I taught and transformed my attitude from just trying to get by to helping my students take on leadership roles in our community. The course began with an overview of the socio-cultural historical theory as described by Lev Vygotsky and Barbara Rogoff. While it sounds complex, the premise is that a child learns by being an active member of his culture. He learns by working together with adults to improve their community together. In this theory, less accomplished team members must work together with more accomplished team members to create something bigger than the both of them. This model of learning was always used to train carpenters, glaziers and blacksmiths by matching apprentices with master craftsmen. Both the apprentice and the master worked together to create art, each learning and growing at his own level. Through communication and example, the apprentice learned and became a master in his own right. The results of the master/apprentice relationship are the great works of art that have stood the test of time. To make this model work, the apprentice in the relationship must be provided with scaffolds to help him accomplish more than he would have ever been able to do on his own. The Zone of Proximal Development (ZPD) is the difference between what a learner can do independently and what he can do with help. I realized that Jewish education was also premised on this master/apprentice relationship. In the good old days (circa 0 CE and before), Jewish children learned how to lead Jewish lives from their parents. There were no formalized schools, and they were not home schooled in the sense we describe today. 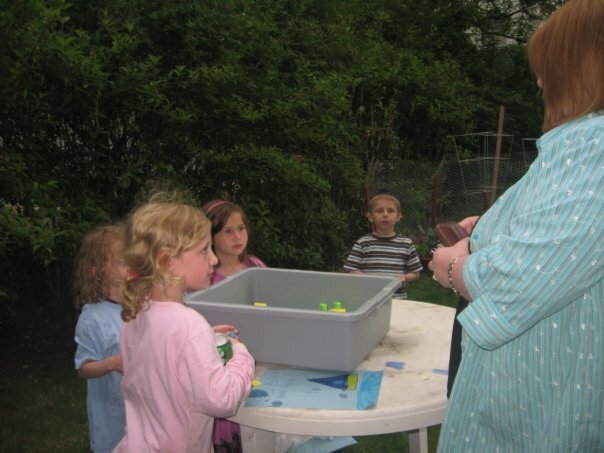 Children learned through hands-on activities and were gradually integrated into communal life and leadership. Boys would work along side their fathers in the fields, come home at night and learn Torah with their fathers. Girls would help their mothers with their tasks and learn Jewish law and morals throughdiscussions with their mothers. The children would learn the values, content and skills they needed to continue the Jewish heritage. As they proved their reliability, they were given increasing roles in their families and society so that the values that the community cherished would continue to the next generation. During the mid first century CE, this all changed. Some orphan boys were no longer being taken in by complete families to be apprenticed as had been done in the past. Yehoshua ben Gamla started schools for children as young as 6 to ensure that everyone would be educated even if it was done in a less ideal way. Girls were fortunate to maintain their original educational system until the 20th century when they too had to be subject to a factory style education. Today, all boys and girls learn about their rich, experiential heritage while sitting in desks and filling out worksheets. Even after the institution of schools by Rabbi Yehoshua ben Gamla, this master/apprentice learning was never completely removed from Jewish life. Jews were given the commandment to teach their children at the Seder using this specific model. At the Seder, parents have multiple mitzvos that they must fulfill. They are enjoined to discuss the Exodus with as much thought as the great sages Rabbi Eliezer and Rabbi Akiva. They must eat matza and marror and read from the Hagadda text. They must drink four cups of wine and sing Hallel. At the same time as they are fulfilling their own obligations, they are commanded to teach their children about the Exodus. We don’t run a model seder and then have the adult seder after the kids go to sleep. Instead, we say kiddush and wash our hands without a bracha. The kids get curious. We eat a bite sized vegetable. The kids get even more curious. We then play ‘now you see and now you don’t’ with the Seder Plate. The kids are finally so curious that they burst forth with questions, each according to his own level. A conversation is begun, and the children are active and central participants of every mitzvah fulfilled that night. As the adults analyze, discuss, learn and grow, so do their children, together with them. Modern Jewish schools have looked to the industrialized model of schooling rather than to our own model of the Seder. Schools became more institutionalized and lost the vision of apprenticing our children into our cultural and religious practices through hands-on, authentic learning. Jewish education is far more than learning how to add or read. While we want our students to be able to translate the Torah, we also want them to be passionate, independent, life long learners. We want them to infuse their lives with spirituality and take responsibility for ensuring that our way of life thrives in the future. We want our students to live as Jews rather than just to learn about Judaism. The structured model of education, while necessary for an institution to function, has inhibited the natural transmission of Jewish values and separated the emotional elements of religious life from the intellectual. Schools have tried to compensate by adding informal education to their programs. However, these activities are a small and contained part of the school experience rather than being characteristic of the entire school day. With informal education, we are still treating our children as subjects to be influenced rather than as important members of the larger society. learn from and with the older generation. The youth misses out the chance to meaningfully impact the whole group. They are also not trained to take over when the experts retire. Invariably, there is conflict between the younger generation and the older generation in managing communal affairs. The younger group has ideas that they feel are not being heard, and the older group feels that the younger members are not respecting the history and culture of the organization they are trying to change. These conflicts would not occur if the younger generation had been naturally eased into their role in communal life having learned how to work their way up by proving their commitment and reliability. In my “Literacy as Social Practice” course, I discovered that there is a different model to use if we can change our mindset. For the past seven years, I have been using the socio-cultural historical theory with great success in elementary school, high school and even with adults. I have blogged about my techniques here, here, and here. The main premise is that the less experienced learner needs to be involved in authentic activities together with the older members. masters. Class is the journey I take with my students to greater expertise for both of us. For students to act as masters would, they need supports. These supports have differed for each age and level. All my students have needed some kind of language support since Biblical Hebrew is not their native tongue. Some students have learning disabilities, and I provide them with supports so they can engage with the rest of class . Other students, while strong academically, have trouble staying organized or focused. Before, I ignored these issues because they didn’t impact test scores. Now, I realize that a key function of my job is to help my students develop in all areas so they can mature into the successful adults they dream of becoming. 21st century ethics. As adults, Torah scholars don’t read emotional poetry to understand a Ramban. Torah scholars debate and innovate. They reflect and learn with chavrusas. They think. Kids love to do this kind of real learning. They thrive on reading the text and arguing over its meaning no matter their age. Unfortunately, most of the time, they don’t have the maturity or language skills to do it. As the master, it is my job to provide them with the Hebrew reference materials and teach them social skills so that they can learn the texts independently every day. asked them what that meant and they told me that the seforim of Rashi, and the Ramban are called by the authors’ initials. The boys were writing a sefer together, and the title came from their initials. Every day on the bus, they were writing down the questions they had in Chumash class and trying to think of good answers before discussing the ideas with their parents. These students were 9 years old at the time. I can’t wait to get my hands on the next sefer they publish. then provide them with everything necessary so they can act like that now. Like apprenticing craftsman, there is a lot of monotonous work. However, the students know the goal is one they appreciate, and they do their drills because it is allows them to do what they really enjoy. 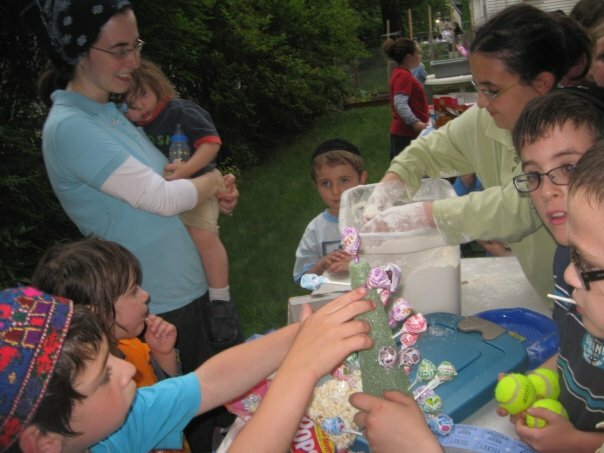 children to feel responsible to help the Jewish community. How do we get them from being takers to being givers? The answer is to get them involved and get them involved when they are young. carry the supplies across the streets. The carnival was a huge hit. 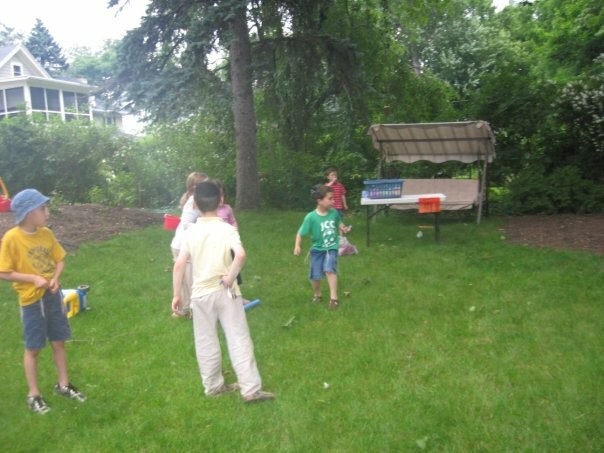 There were relay races, a bounce house, a lollipop game and they even made food to sell. Entrance table manned by Ester Tova who really wanted to be in charge of the cash. Notice the sign for frulowups. She was aided in her task by a helpful high school sophomore. Pinny (standing in the back next to the laundry basket) coordinated the relay and balloon races for the big kids. this table is the girl with the orange shirt. Kids helping an adult play “find the boat with the dot.” Her wallet is out! Hurray! 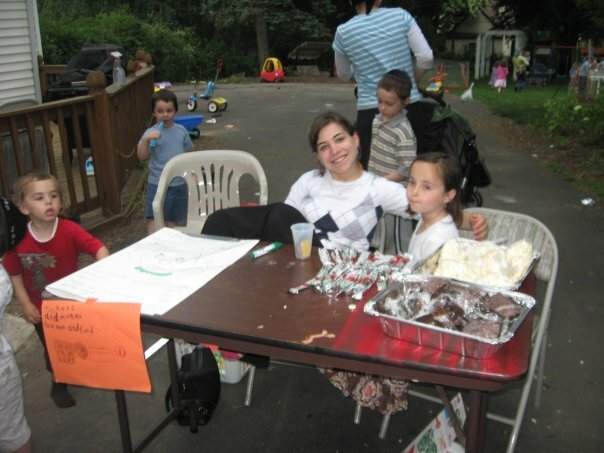 This table is manned by Chana, the young lady in blue. end, the class made $43 which they proudly donated to their Day School. They felt like they could do anything. Would you be surprised if I told you that this class has organized class fundraisers whenever they are given the chance. Last year, they earned enough money to go to the Corning Museum of Glass. This year, they have been working all year to save up to go to Niagara Falls. teaching the next how to take care of the shared experiences they hold dear by giving them responsibility. The younger boys understood that not only could they care for the shul, but that they were also responsible for training the next group of boys to take over from them when the time came. and then ask yourself the following questions. What tools can I provide? religious identity that involves community life and a commitment to Jewish learning.